According to a Sam Houston State University history professor, some of Hollywood's hottest directors these days are John Wayne junkies. And when Hollywood gets around to marking the 100th anniversary of the birth Wayne a little over a year from now, Distinguished Professor of History Jim Olson's work may play a prominent part in how the "Duke" is remembered. 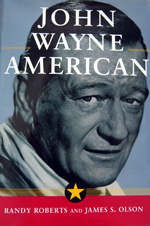 Born Marion Robert Morrison on May 26, 1907 in Winterset, Iowa, the son of Clyde and Mary Brown, John Wayne is an actor who Olson believes is greatly misunderstood. 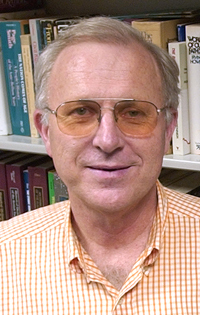 Olson co-authored "John Wayne American," a book that received the 1995 Pulitzer Prize nomination for biography. He said that Wayne was a better actor than most people realize. "People think that Wayne was not a very good actor," said Olson. "The directors we spoke to who worked with Wayne said he was a brilliant actor--within a narrow range. "There were just certain roles he would not accept," said Olson. "He would not take a role that he felt denigrated women, or was cheesy. As an example, his romantic interest had to be close to his age." Olson and co-author Randy Roberts learned that several of today's most successful directors, including Martin Scorsese, Steven Spielberg, Paul Schrader and George Lucas, were heavily influenced by the Wayne movie "The Searchers," which is considered a western classic. "Scorsese and Spielberg watch it once a year," said Olson. Harry Carey Jr., one of the cast members in that 1956 film directed by John Ford, said that when Wayne said his lines vowing to find who killed one of the young women who had been found abused and dead, his performance was chilling. "When he said those things he scared me," Carey told Olson. After the scene was shot, the crew discovered that Ward Bond had accidentally kicked an electrical line and Wayne's work was lost, so they had to shoot it again. "The second time was just the same," said Olson. "Only more blood-curdling." Wayne was a bright guy with a great sense of humor, said Olson. Despite making many violent movies, his personal favorite was "The Quiet Man," the story of an American boxer who returns to Ireland. Wayne's mother, Mary, was of Irish descent, and described by Wayne as "a tiny, vivacious red-headed bundle of energy." "He was so smart," said Olson. "If a scene was being shot and someone messed up, he could adjust his dialogue on the spot and save the scene so it didn't have to be re-shot. The directors loved him." Wayne finally won an Academy Award for his portrayal of a drunken, uncouth and determined Rooster Cogburn in "True Grit." Some said it was a sentimental selection to honor Wayne in the twilight of his career. Olson said it was probably way past due.